What Is 301 in Darts? This type of gameplay is entirely different from others as you start with a score of 301 and try to work to zero from there. Whoever reaches this first, wins. There is also a 501 and an 801 type setup. These work with the same principles but with fewer points. The benefit of 301 is that games are much shorter and can, therefore, be much more exciting. You can play as teams or as individual players. But remember that if you score more than the total needed to reach zero you are "bust." If this happens, your score is reset to the count with which you started that turn. It also happens if your score is more than your score at the time. Besides this standard dart rules apply like that you should not cross the line. Triple: The thin middle ring is a triple. 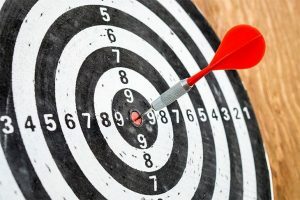 So try to aim here if you are looking for a triple of a number. Double: The thin outer ring and the bullseye and ring around it is considered to be doubled. So the score on which you land should be multiplied as two. The bullseye is one because it is scored as 50 points. Single: If the dart hits one of the two larger inner areas on the board the score isn’t multiplied. For example, If you score in the twenty section in one of these areas it will only count as twenty. You need to throw a double before you can start earning points on the scoreboard. Keep in mind that at some tournaments and even pub games you will play in three legs. That means that there will be three complete games and the player who wins two times is the victor. If you feel you need more information take a look the following article about the rules for darts. Before you begin the game, you need to figure out who is going to throw first. The goal is to make it as fair as possible. You can either flip a coin or give each player a dart and see who throws closest to the bullseye to see who will go first. Like bowling, standing perfectly with the right posture is key to playing like a pro. You should stand with your right foot forward. It can help you aim and throw straight by helping your body to align yourself with where your dart is going. If you are left-handed, you could prefer standing with your left leg in front. You want to lean forward but not so far that it affects your balance. Your weight should mostly rest on your front foot with just enough in the back so that you stand solidly. You need to be as still as possible. You want to hold the dart stable. But you shouldn’t tense as this will impede the throw. It can take some practice to get it just right. People often hold their dart with only two fingers. However, using more fingers will give you much more control over the dart. Try to use three. If you have a good grip the end of the dart should be pointing up. You should only aim once your posture and grip are right. Casual players often tend not to worry too much about the way that they aim. However, there are some tips and steps that you can follow to up your game. Firstly, you should raise the dart to eye level. Try to keep your arm at a 90-degree angle. Next, you aim the tip of the dart at the target. It can help you to be more accurate if you close one eye. You should throw the dart with your wrist and hand, not your arm! You can use your elbow to increase the speed but keep your shoulders and upper body still. Your wrist needs to snap forward when you make the throw. It will be more accurate if you let your arm to extend a bit. Remember that you need hit a double area before points start counting. If you are playing in teams, at least one person in each needs to get one. It is a great idea to ask a neutral person to write down and calculate the scores for you. They need to record every player score after their turn and double or triple it if that is necessary. It works best if they add this to their total after each turn so that everybody knows where they stand and what they need to aim for. Per the rules of the game, you should continue with the rounds until one player reaches zero. If individual players are competing this player will then win. However, if you are playing in teams, you will still stop when one person reaches zero. You then add all the members of the group scores together. The team with the lowest total are the winners. If you follow the steps above you should be ready to play a 301 game. Here are some additional tips for being a great player. Set up the scoreboard beforehand. Draw up a table that has a row for each player and columns to write down the score of each round. For 301, it works well to have a total column after each round so that you can keep track. Buy an "outchart" to help you plan where your dart should land. It shows you what you should aim for if you need a hundred points or less. It can help you to avoid miscalculation and will save you a lot of time. Read our article on how to throw darts to make sure that you have the basics down like your posture, grip, and aim. Aim for big scores on your first two or three throws so that you make up some points early. After three or two throws focus on how you can reach the final score. Now you can just focus on rounding up the total. Before you take a shot at it, look at this youtube video to see how it a 301 game looks. It will give you an idea of the length and pace. It is great to know what you are getting into beforehand. 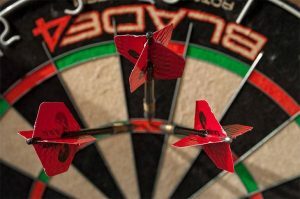 All these tips will help you when playing a 301 dart game. Remember that the essential thing you can do is to practice, practice, practice. The more you practice, the more accurate you will be at hitting your target. You will need this skill to be able to get the exact score you need to reach your end goal. These types of games are much easier if you have some experience with darts and might be a bit tricky for new players. But after a few tries, you should start to get the hang of it. Follow this guide for your next game and tell us how it went. Don’t forget to share it with your team members.